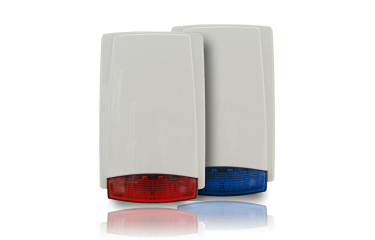 KR100 red \ KR100 blue is an outdoor siren, designed for burglary, assault and fire protection alarm systems. Source of acoustic signal is high effectiveness of special quasi dynamic piezo electric transducer. Source of optical signal are two high brightness LEDs. 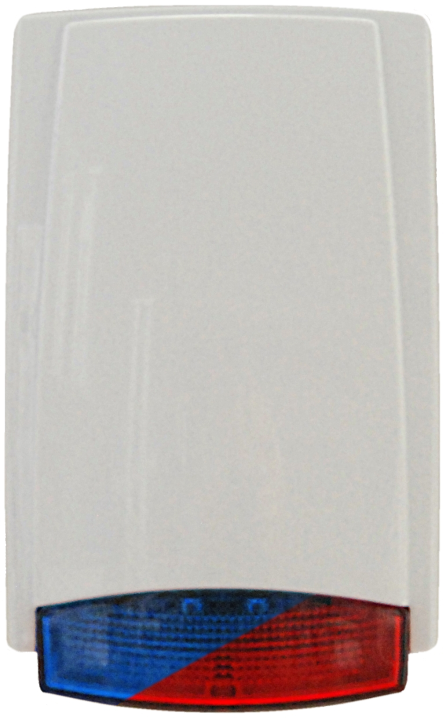 The casing has anti-tampering protection from cover opening and from detachment off the base. One of its advantages is very high mechanical shock resistance thanks to using the mixture of 70% polycarbonate and 30% ABS. Circuit impregnation assures high reliability even in severe weather conditions. Optional: 1 min., 4 min., 16 min. Optional: 1 min., 4 min., limitless. Flash Together Three Times Every 5 sec. - Bell trigger activation. Anti-tampering protection Cover opening, detachment off the base.